American experts believe the satellite North Korea launched into space has finally stopped tumbling and reached a stable orbit, but it is still highly unlikely to be producing data and sending it back to earth. Many suspect the satellite launch was an intent to test the distance the rocket sending it into space could fly, not an attempt at installing a functional satellite. “It’s in a stable orbit now. They got the tumbling under control,” a U.S. official told Reuters Tuesday, after reports earlier this week that the Kwangmyongsong-4 “earth observation satellite” had not reached a point at which it could properly function. On Monday, officials claimed the satellite could be clearly observed “tumbling in orbit,” rending it entirely unable to collect and transmit data. This report coincides with claims by South Korean officials that the object launched into space was “useless” to North Korea on the ground. North Korea previously attempted to launch a satellite in space in 2012. 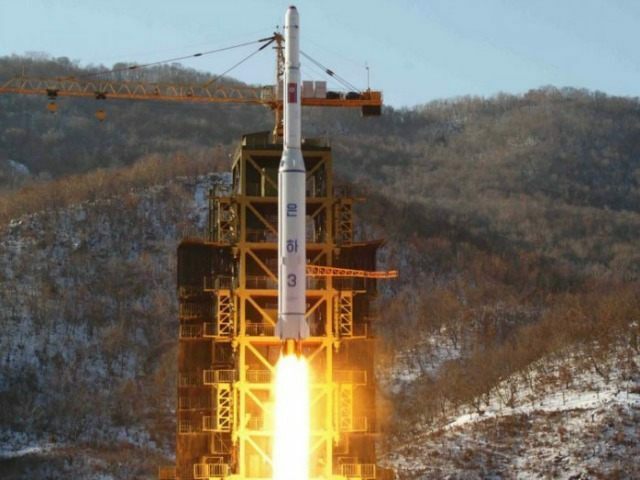 That object never stopped tumbling, however, and its launch was considered a “failure.” Experts tell Reuters, however, that whether or not the satellite works will not have a profound effect on whether Pyongyang sees the launch as a failure, because the object reached its destination, proving the rocket itself worked. Calling the launch “provocative, disturbing and alarming,” U.S. Missile Defense Agency director Vice Admiral James Syring said Tuesday that, while the rocket appears to have the range necessary to reach the continental United States, the satellite launch cannot be seen as a test of North Korean intercontinental ballistic missile (ICBM) technology. The Pyongyang government appears to have taken a number of security precautions to make it more difficult for South Korea, the United States, Japan, and other interested parties to predict the satellite’s launch and study the rocket used to place it in orbit. CNN notes that South Korean officials believe that North Korean engineers “affixed a self-destructing device to the rocket booster in order to prevent other parties from studying its capabilities.” South Korea has found 270 pieces of the rocket since its launch. Japan’s Asahi Shimbun adds that, long before the launch, North Korea appeared to take numerous measures to hide the launch site and the shipment of multiple parts of the satellite to its destination. “North Korea did not want satellites to pick up what the cargo was or to allow radar waves to deflect off the object,” a source told Asahi. The launch site appeared covered with a large awning to prevent satellite images showing a rocket launch area.